You might have heard about the use of drones to support humanitarian actions. So, today we are going to see how drones or UAVs (Unmanned Aerial Vehicles) can also have an impact in the healthcare sector in developing contexts. While drones have been mostly piloted in sectors such as transport, energy, water management, urban planning and disaster risk management/disaster recovery, they have only recently been more widely accepted within the medical community. antiretroviral therapy for pregnant women with HIV. Particularly, an interesting example of using a drone for delivery of medical supplies is provided by Zipline, whose drones have been used in Rwanda to deliver and distribute blood to transfusion facilities . The ability to distribute blood on demand has the strong advantage of avoiding having to store blood in local hospitals as blood itself has a very short shelf life and strict storage requirements. Local people call it the ‘Sky Ambulance’. Zipline technology has been promoted in Rwanda in 2016 with support from the Government, while Tanzania announced the adoption of the Zipline technology in 2017. Five simple steps (order by text message, pack, launch, direct delivery and drone recovery) are required to guarantee blood safe delivery to remote health centres, as shown in this video. In Malawi, in 2016, Unicef and Matternet piloted the use of drones to fasten HIV testing procedures in order to assure an early diagnosis of HIV and promote early treatments. Just to give an idea, in Malawi, it currently takes an average of 11 days to get samples from the health centre to a testing lab, and up to eight weeks for the results to be delivered back. The longer is the delay between test and results, the higher is the default rate of the patient . Drones could play a key role in reducing this delay. Another very interesting and promising application is the TU Delft Ambulance Drone, developed at the TU Delft University in Holland. This is a prototype that integrates a cardiac defibrillator, a 2-way communication radio and a video into the drone. A smartphone app is used to call the drone during an emergency. Once the drone arrives, bystanders would be instructed on how to perform cardiopulmonary resuscitation (CPR) and start using the automatic defibrillator until the emergency services arrive to take over. Rishi Madhok, an emergency physician at the University of California at San Francisco hospital has identified three main stages of drone usage: “reconnaissance”, where drones provide aerial photography of the scene of an accident or natural disaster; “delivery”, where drones transport needed medical equipment and drugs; and, finally, “medical command”, where drones, through their video sensors, provide high fidelity data and two-way communication between providers and responders — or even lay people — on the scene . As the first two stages are now reality, we might be very close to the third stage of drone use. TED Talk, Keller Rinaudo, CEO ZIpline International Inc.
Two examples of how mobile technology can support cash for health programmes and how financial payments have led to the emergence of “results-based financing” (RBF) mechanisms as an alternative financing model for healthcare. ‘Although the quality of health services is an essential condition for the success of any health action, underutilisation of health services is more often influenced by demand-side barriers rather than supply-side limitations’. This statement is extracted from the ‘Cash-based Interventions for Health programmes in Refugee Settings’ review by UNHCR. However the document concerns specifically Refugees, I believe that it can be applied to the overall population, particularly in vulnerable contexts. Interventions in the healthcare sector have been historically focusing on providing solutions to the supply-side of healthcare (healthcare providers) rather than the demand-side (access to health services by patients), except to provide access to health-related products (such as insecticide-treated bed nets) or to support nutrition. However, in the last few years, we have seen a gradual shift towards addressing some of the challenges that vulnerable parts of the population face when in need of healthcare services. One of these challenges is the cost of basic health services, such as antenatal care or delivery care. Although there is still little documented evidence of the use of cash-based interventions for health services in the humanitarian context, some interesting examples are involving the use of mobile technology. In this post, I am describing two examples of mobile applications of cash for health. M-TIBA is a mobile-based health wallet, that allows anyone to send, save and spend money specifically for medical treatment. Individuals can save money for themselves, for a family member or friends. Money stored on M-TIBA can only be used to pay for treatment and medication in selected partner clinics and hospitals. Furthermore, in order to guarantee and monitor the quality of the provided healthcare services, partner clinics need to be recognised by the SafeCare standards. If you would like to know more about this technology and its impact on the society, watch this video about M-TIBA being a supportive tool for pregnant women in Kenya. In Tanzania, traditional birth attendants (TBAs) are typically paid to assist deliveries. It’s, therefore, a financial disincentive for them to refer their patients to health facilities, since this would represent a loss of income. However, health risks increase when deliveries are not performed in appropriate facilities. Henri Nyakarundi is the winner of the first edition of “ICT for Social Good” Grant, organised by Ong2.0 within the Innovation for Development Programme. 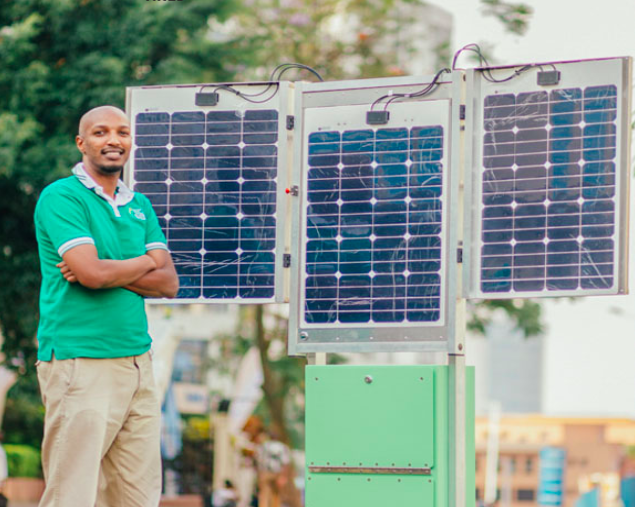 He developed and commercialised a mobile solar kiosk, which offers customers a convenient low-cost solution to charge their phones, to browse the web and to have free offline access to digital content on board, such as music, news and information on health and education. It works on a franchise model, giving people the opportunity to run their income-generating micro business. Growing economies need accessible electricity in order to improve life quality, to connect with people and to develop new kind of business and activities. This is not always easy. Even in Rwanda -where solar and other renewable energy sources play a big role in government’s policy to connect 45 percent of the population by June 2018- in some areas people are still cut off, with no facilities. They rely on mobile phones in order to connect to the outside world, but charging devices can be a struggle. In areas with limited access to electricity, people have to make the journey into the nearest town for a single mobile charge. This lack of available and stable power is a big problem, but it could also represent an opportunity for business and social development. This was exactly the vision of Henri Nyakarundi, who tried to transform this challenge into a good idea. In 2013, he founded Ared -African Renewable Energy Distributor- a hardware, technology and service company who developed a “business in a box” solar kiosk to empower communities using a micro-franchise business model. This solar kiosk, called Shiriki Hub (the Swahili word for “sharing” Hub) is a kind of shop on wheels, where people could recharge their phone or other small electronic devices, paying a small fee. It can charge over 30 mobile phones at once and it could be locked to offer better security while charging. The kiosk can also be towed using a bicycle or a motorbike and the lithium battery bank allows the operator to work even at night or during rainy or cloudy days. The second version of Shiriki Hub came after the first prototype. Two are the greatest novelties. The new solar kiosk incorporates connectivity solutions such as the Internet and the intranet access via wifi and a backend software system to better monitor performances and sales. Since the first kiosk was operational, customers were constantly requesting access to the Internet or to digital content. In fact, the available Internet services were quite expensive for the majority of the people. That’s why Nyakarundi decided to develop a low-cost Internet access and to broadcast education content, health information, videos and music in the local language for free, thanks to an offline mobile application. That’s a good and simple way to give everybody the opportunity to be part of the digital revolution. And for those who do not have a smartphone, he added a speaker system that will allow operators to distribute audio content. The other novelty introduced at this stage is a software system that allows monitoring almost everything that is happening on the kiosk, from the sales to the location and much more. So, Ared can potentially manage and monitor thousands of kiosks with just a handful of people. This is a great advantage for scaling Shriki hub business and approaching other countries. Unemployment is a general problem in Africa. According to the recent “World Employment Social Outlook – Trends 2017” published by the International Labour Organization, “the unemployment rate for the African continent as a whole is likely to remain unchanged from its 2016 rate of 8.0 percent going into 2017, which, when applied to a rapidly growing labour force, corresponds to an increase in total unemployment of 1.2 million”. Entrepreneurship has often been viewed as a good way to solve this issue. However, entrepreneurship requires knowledge, access to capital, training and support. In order to address the unemployment problem in the region, Nyakarundi had the idea of creating a network of micro-entrepreneurs thanks to a low-cost franchise business. In short, he offers franchising opportunities to people that demonstrate high business potential, allowing them to earn a living. “Many people want to be in business for themselves, but they don’t want to be in business by themselves”, said Nyakarundi, so the micro-franchise seems to represent a winning approach. For buying into the franchise business people have to pay 50 dollars for man, 25 for women and 10 dollars for people with disabilities and then they get the kiosk and the possibility of selling a wide range of services as phone charges, bus ticketing, prepaid services and electronic vouchers such as airtime, government services, Internet and intranet access etc. The micro-entrepreneurs have also access to a specific training program on marketing and taxes, to maximize income on the kiosk. Kiosk operators make a commission on every transaction made on the kiosk. Demand is substantial in Rwanda, both for new jobs and for access to electricity and the Internet, which means that Shriki hub has a huge market potential. Ared company that is expanding his social business in other countries. Shiriki hub demonstrates a positive social, economic and environmental impact on local communities. To keep costs for users as low as possible, Ared aims to generate a significant portion of its profit from advertising on the mobile interface that people use to access the Internet or by providing the possibility for businesses to collect data by conducting surveys. The charging station could be useful not only for the private sector but also for government entities and non-profit sector. For example, charging stations were used at Rwanda Red Cross refugee camps housing Burundi immigrants fleeing their country’s violent political crisis. Refugees were trained and worked as operators, earning income from the kiosk. Ared developed also a specific program for people with disabilities to give them an alternative into micro-entrepreneurship. The company discounted the micro-franchise fee to 10 dollars, which includes training, support, access to a solar kiosk and a start-up capital for the business. The target for the future is to reserve at least 10% of franchisees to people with disabilities. Get to know Henri better. Read the interview. Elizabeth Kperrun is the winner of the “ICT for Children” Grant, a special recognition offered by Fondazione Mission Bambini within the framework of “ICT for Social Good” Grant. The Grant was created to reward the project that better represents the usage of innovation for childhood. 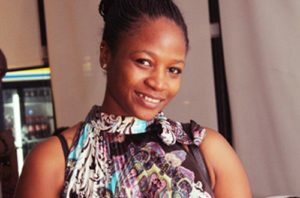 In Nigeria, Elizabeth developed some fun educational mobile apps that teach kids using Africa’s native languages. We asked Elizabeth some questions to get to know her better and here is what we discovered. I am from Benue, a state in Nigeria and I am the first of 5 children. I have a diploma in Mass Communication and I am currently in the process of obtaining a B.Sc in Entrepreneurial and Business Management. What is Lizzie’s Creations, a startup, a social enterprise…? How did you start your business as Lizzie’s Creations? Lizzie’s Creations is a start-up company that is preserving and promoting African culture using modern day technology. Our business started in September of 2016 but we built our very first app (AfroTalez) in 2013. Back then though, we were trying out our idea of promoting an aspect of African culture to see if it was something the world will be interested in. My husband and co-founder. 100%. When I met him, all I had was an idea. I had no IT background. He helped me develop my idea, build my first app and has been my partner ever since. You are a young woman in tech, what are the biggest challenges you have faced in your career? Female entrepreneurs in Africa find it harder to break through in business than their male counterparts. A young woman in the tech space is even doubly harder because technology in Africa is still not as advanced and recognised as it is in the more developed world. Some of the biggest challenges I have faced would be recognition and encouragement by my country’s government. There are no grants available, no provision in the budget to fund tech start-ups. So we have to rely on foreign organisations and investors to raise funding to enable us to grow our businesses. Add this to other factors like epileptic power supply, unstable internet infrastructure and a volatile economy and one really has to be resilient and believe in what they are doing so that they can keep going. Why did you decide to focus on the use of ICT for Education? According to you, what are the main advantages and issues in the use of technology for learning and education? I decided to use ICT for education because the world has gone digital. It is the fastest means of reaching an audience today and as smartphones get cheaper, they become more easily accessible to even the low-income earners. In Africa, a smartphone is cheaper than a TV set and like everywhere else in the world, people are spending more time on their smartphones than on anything else, even to keep children entertained. What is the learning model/approach behind your apps? Children learn best while they are having fun. And this is why we have focused on using well designed and brightly coloured apps to educate children. We believe that learning doesn’t have to feel like a boring classroom lesson. It should be fun. Are your apps designed for being used by children alone or as a tool to support teaching at school or in the family? Depending on the age of the child, our apps can be used alone or with the supervision of an adult; be it a teacher, parent or guardian. How to ensure we have enough money so that we can keep doing what we do. Because with funds, every challenge is surmountable. Start small, fail small. When launching a new product, build a Minimum Viable Product (MVP) and test it. Observe consumer reaction and ask for feedback before you proceed. Sometimes, what we set our mind on building is not what the audience wants. It is only by hearing from them that we can build and roll out a product that will be utilised and enjoyed. According to you, what role the ICTs could play in strengthening the local development and the business ecosystem in Africa? ICT’s are very important to the technological and overall development of Africa. A lot of innovative work by a number of companies targeted at various areas of development, including governance, health, education (such as ours) and more is currently ongoing and already creating impact. The combined effect of all these will result in better standards of living, improved opportunities, better educational outcomes and general improvements to Africa’s development. In our field we are making relevant education more accessible to children at in the lower rungs of society. How can Lizzie’s Creations be considered an inclusive business? Lizzie’s Creations is certainly inclusive, our focus in whatever we do is to impact women and children mostly are less privileged. This is one of the reasons why we transitioned our apps to an ad-revenue model which allows access for even those who cannot pay for the in-app purchases. In terms of revenues, what is the core business of Lizzie’s Creations? We primarily monetise through unobtrusive in-app advertising and in-app purchases. How many apps have you developed? How did you choose the app team? I saw, for example, that the last app that you have launched in July 2017 is dedicated to African fashion. We have developed 3 main apps. 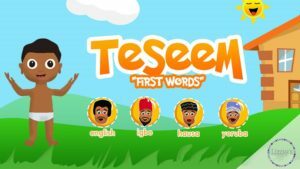 In all our apps, the over-riding theme is always the promotion of some aspect of African culture while promoting education. We aim to keep teaching the younger generation about the African way of life. Our latest app, Shakara, is a dress-up game for girls who like fashion. We built it with African fabrics and African fashion styles because we believe African fabrics are vibrant and beautiful and our style is unique. So it is our aim that our young girls should learn about these fabrics and styles and take pride in them. There is any collaboration with parents and teachers in the development of the app themes? We do some collaboration. Before we start working on our apps, we conduct a poll and ask parents and teachers what they think of our idea and how they feel their children/wards will most benefit. Then we use their feedback to build a beta version which we use for further testing. 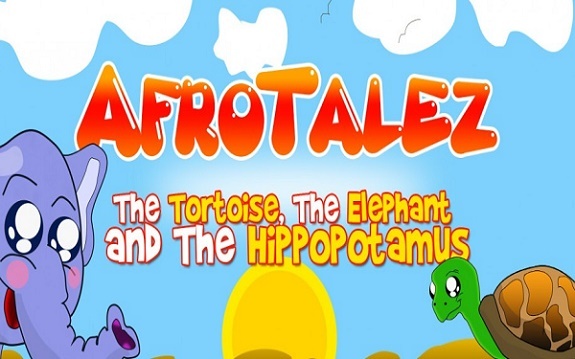 It is after these tests that we finally release an app into the store for children to download and use. Is the government supporting somehow the social entrepreneurs in Nigeria? What could it be done better? To some extent, they try to be supportive. But as with most systems that don’t work properly, sometimes finances disbursed or budgeted for SME’s do not necessarily get to the SME’s. This can be mitigated by building a more transparent system. Social entrepreneurship most often seems like an uphill battle. Because investors want to invest in money-making businesses and social ventures are mostly about making the world a better place first and profit-making comes second. But more and more, we are getting a new breed of investors who are primarily looking for social entrepreneurs to invest in. So I would say to new and aspiring social entrepreneurs that they should follow their passion. Somewhere, somehow, if their idea is a good one they will always find somebody else who believes in them and their vision and will be willing to work with them to help them grow. What is your message to women in tech? Kudos to them and more grease to their elbows. Women are bright, resourceful and hardworking. We can do anything a man can do and we even do some things men can’t do. My plans for the future are to keep growing and to keep teaching children about Africa: our culture, our languages, our way of life. I love what I do. I will not be leaving it anytime soon.